Betting on Major League Baseball at FanDuel is different than any other online sportsbook. That's because FanDuel isn't a sportsbook at all, it's a fantasy betting website. Users at the site create fantasy baseball teams and enter them into different contests constructed by the site, other users, or even their own. Betting on fantasy baseball is a completely different process than traditional MLB betting. What's really neat about playing fantasy baseball at FanDuel is that it's 100% legal to place real money wagers. While this is true for online sportsbooks, FanDuel actually operates in the United States. This is something that is different from most sportsbooks that have MLB odds. Fantasy sports betting is not in the same category as sports betting, which allows websites to operate in the U.S. Because of this, fantasy betting sites have exploded; none more so than FanDuel. This website is the #1 rated option for wagering on fantasy baseball. Find out what is offered, how to win money + more. What Is Daily Fantasy Baseball? The idea behind fantasy betting sites like FanDuel is daily leagues for Major League Baseball. This stems away from traditional MLB fantasy leagues that are season-long. Daily leagues allow for a year's worth of results in just one day! What's more, daily fantasy baseball games at Fanduel do not have a cap on how many contests users can enter or the profit that can be made. Users with an account are able to enter into contests that are available at FanDuel. They offer leagues, tournaments, head-to-head, and 50/50s. The freedom to choose the contests is definitely a plus at FanDuel. A plethora of tournaments are available each day on MLB betting sites during the MLB season. They vary in size, entry fees, and how winnings are dispersed as well as the salary cap that owners get to assemble their teams. Users have the opportunity to enter into a tournament that meets their specific budget requirements. Additionally, the chance to form their own tournament is available. Tournaments can be invite-only by another major fantasy baseball website, or open to all account holders at FanDuel. Similar to tournaments, leagues allow for users to join different contests to win money. Leagues have a set number of entries and once full, they are closed. The amount of money that can be won through a league can be anywhere from a few dollars to several thousand. This type of contest involves just two users going up against each other. This is a winner-take-all format. Users can play other account holders that they know, or join random head-to-head challenges. This is a contest where half of the field will double up, while the other half of the field will lose their entry fees. The nice thing about 50/50 FanDuel fantasy MLB tournaments is that half of the field will profit, which is something that you don't see much of when playing for money. It's very simple to fund a FanDuel account. Users can deposit with a Visa card or through PayPal. The fact that PayPal can be used is very appealing. Online sportsbooks are not able to let account holders use PayPal because the company does not associate with domestic gambling. Fantasy sports betting is not considered gambling, and therefore PayPal endorses it. While at many sportsbook credit cards are the main method of deposit, it's very evenly split at FanDuel because of PayPal. Continuing with the PayPal theme, payouts can be conducted through PayPal and transferred almost immediately after approval of a withdrawal request. FanDuel allows PayPal deposits + payouts to maximize convenience for the user. For those that deposit with a credit card, a check can be sent through the mail, which only takes about a week to receive. FanDuel is the king of MLB promotions. They offer the largest daily fantasy baseball competition in the world! There is more than $1 million in cash and prizes available to those that sign up and participate. This includes a $200,000 1st place prize. This promotion is held annually, and only getting bigger each season! 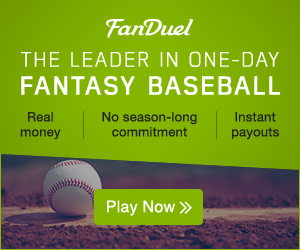 If you want to learn more about FanDuel's MLB contests, click here to go to FanDuel now. FanDuel.com - Best Daily Fantasy MLB Site!